Bombers in training at Kavumba Recreation Grounds. With the Commonwealth games slated for early next month, the National Boxing team, Bombers have intensified their preparations. The team has took part in the ‘Bingwa wa Mabingwa’ tournament in Tanzania earlier this month where they emerged second overall with three gold and two silver medals. 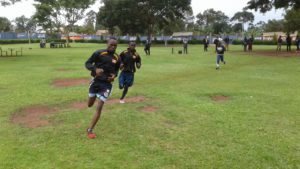 The Bombers have been in camp for several days at the Kavumba Recreation Grounds where they have been undertaking intense training. Before their departure, they held a press briefing where they assured the general public that they are ready to do the nation proud by winning medals. Speaking at the briefing, UBF president Moses Muhangi, who spearheaded the whole preparations gave an insight of the preparations. “First of all i would like to thank the entire federation for supporting the whole cause and boxing in general. “We have a coaching stuff that is so experienced and has been guiding the Bombers well which has helped us throughout our preparations. “We have worked under so many challenges but we have managed to move forward. “Our former president submitted names of the personnel that are representing the Country in the Commonwealth games slated for next month to the International Boxing Association(IBA) and the International Olympic Council(IOC) and the list had names that we could not change. “The only issues we could tackle was to reduce the numbers from 21 to five boxers, which we are still in the process of doing as we still have eight in total. UBF president Moses Muhangi addressing journalists. “As far as i am concerned, we have put all of them in good shape and i think they are all ready to go. “The team will be departing on Saturday the 24th of this month and i pray that they bring the desired medals. The Commonwealth games are slated to start on 4th-March-2018 and the 5 boxers who will be chosen to represent the country will team up with the other athletes from team Uganda. 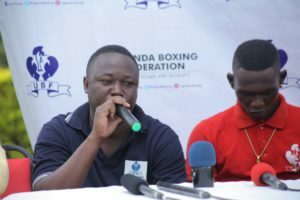 The Camp in Kavumba will end in Thursday as the boxers who will be travelling will be given some time off to go say bye to their families before they set off on Saturday. The flagging off of the team will be on Friday morning and is expected to be graced by President Yoweri Museveni. The boxing team which is leaving for the commonwealth will be accompanied by head coach Lola Kalyango who assured the country that the team is coming back with medals. “Am so grateful for the support that the federation has given to us through out our preparations. “What i can assure the country is that all the boxers as in good shape to bring home the medals. “I will ask every Ugandan to pray for us and continue their support so as we achieve our desired objective.